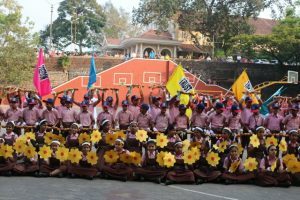 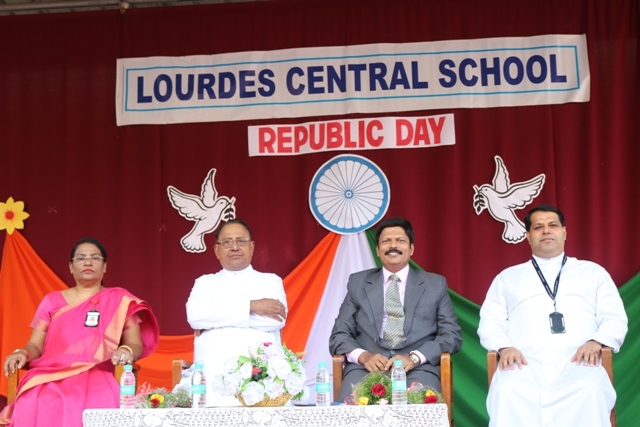 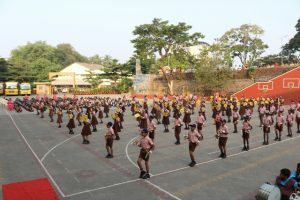 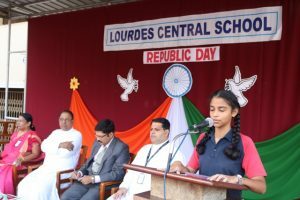 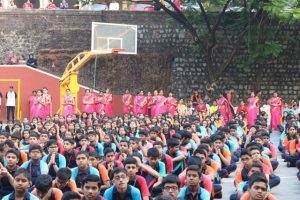 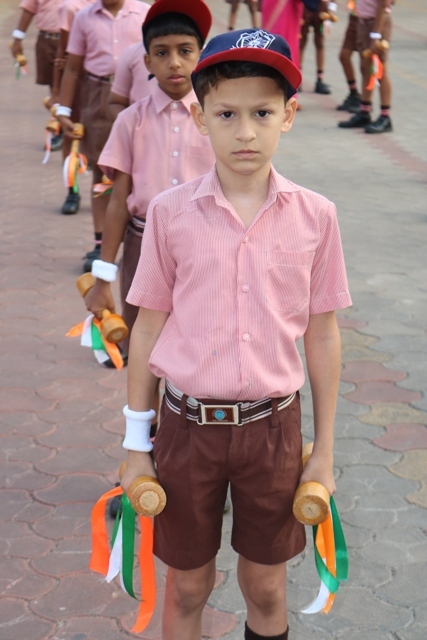 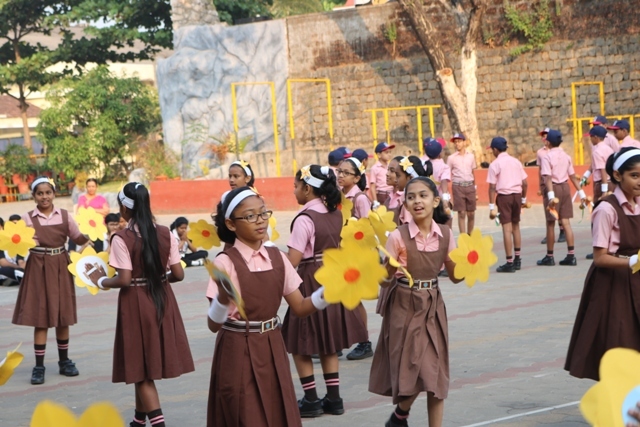 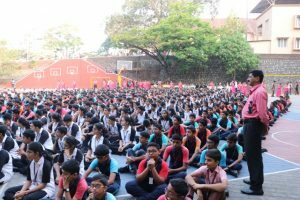 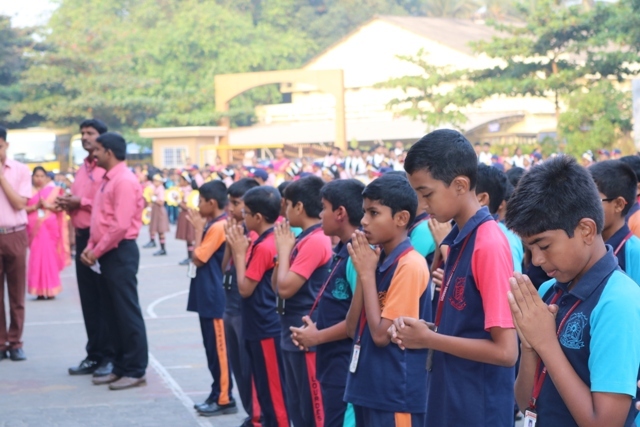 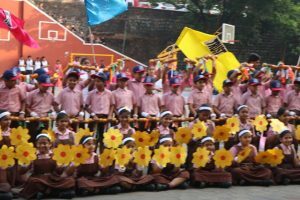 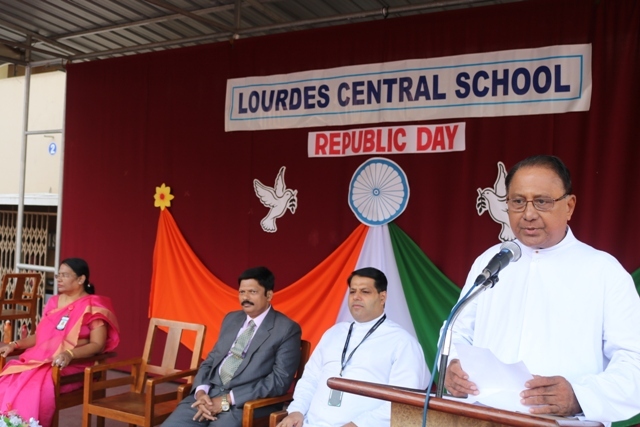 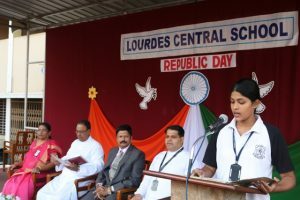 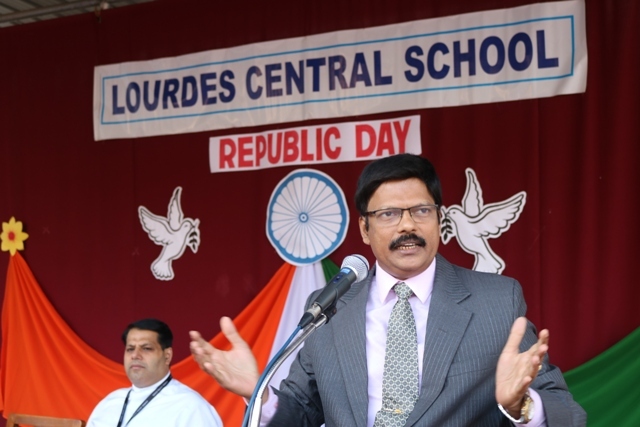 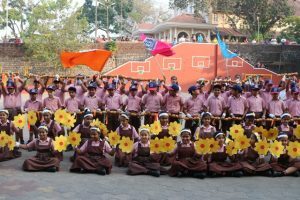 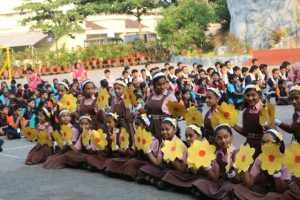 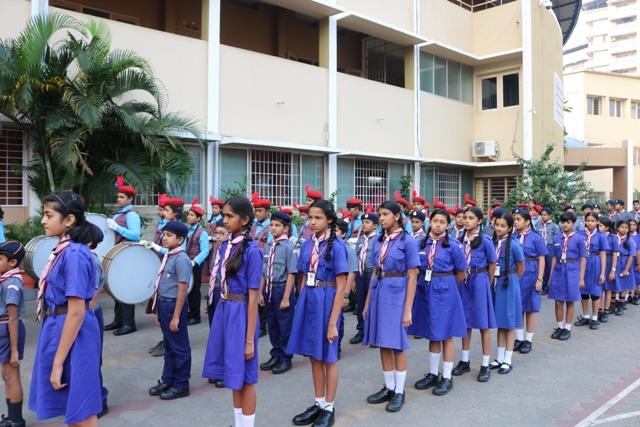 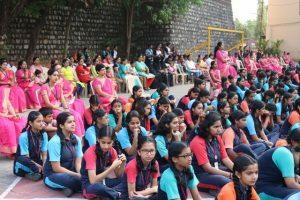 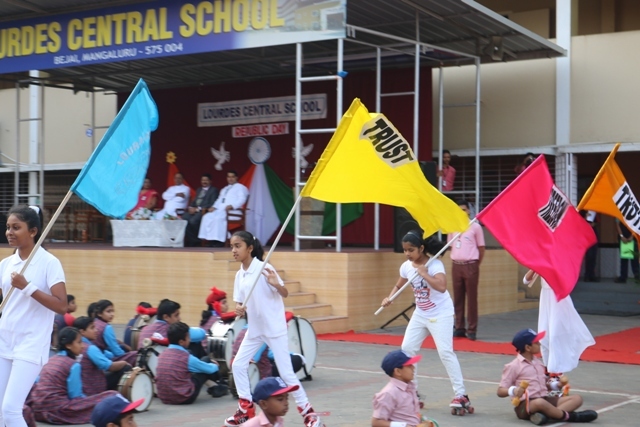 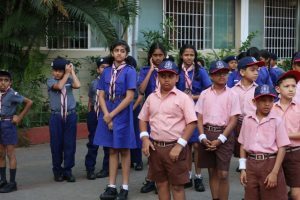 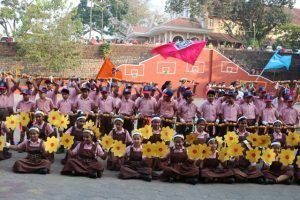 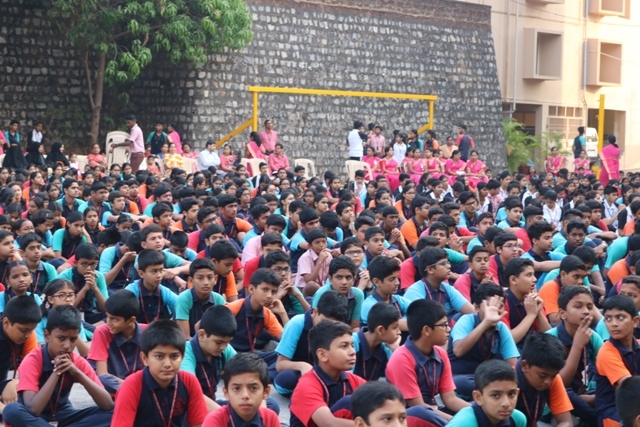 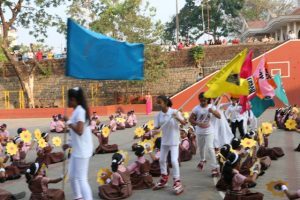 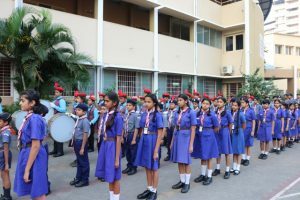 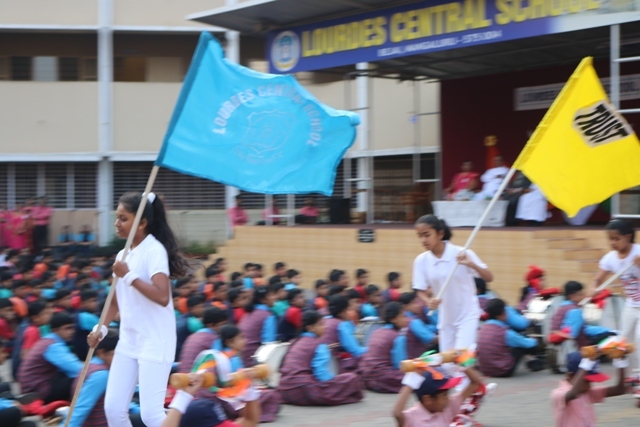 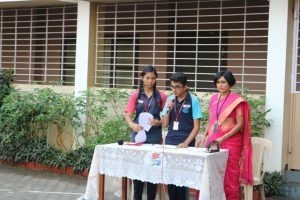 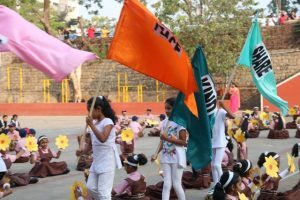 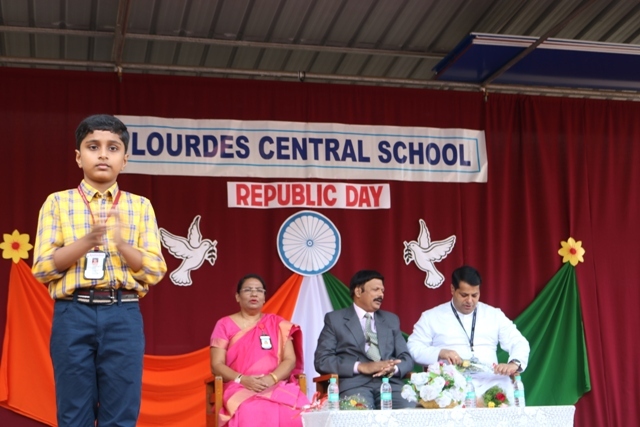 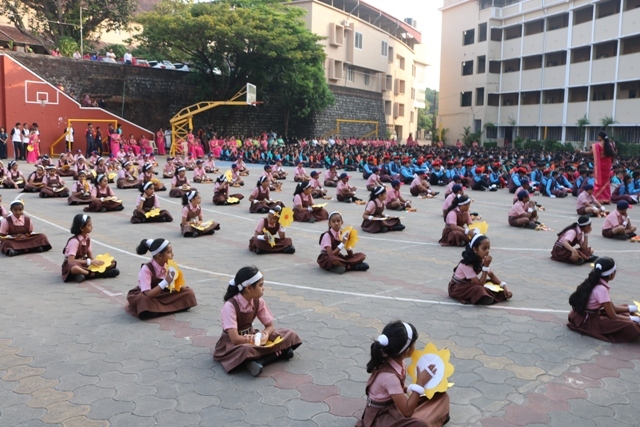 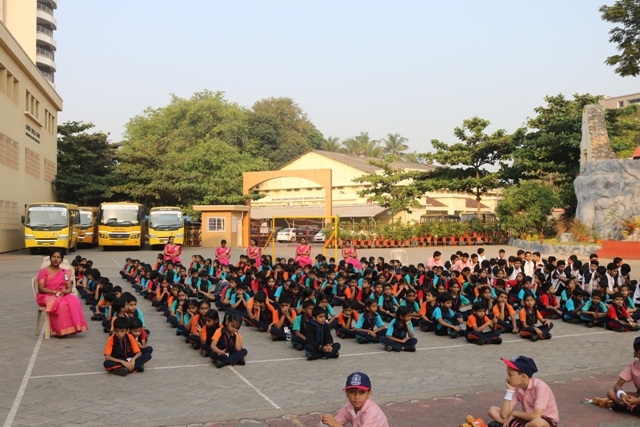 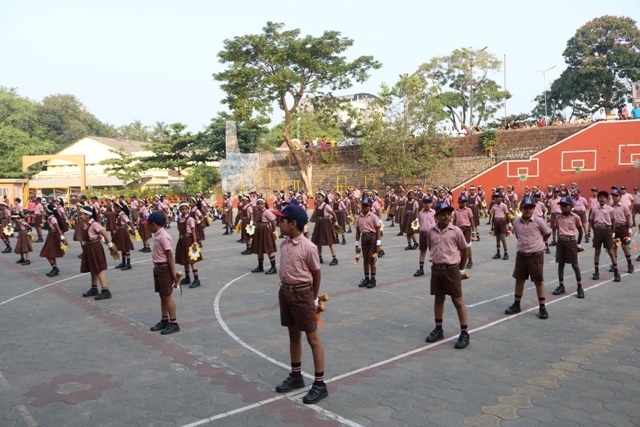 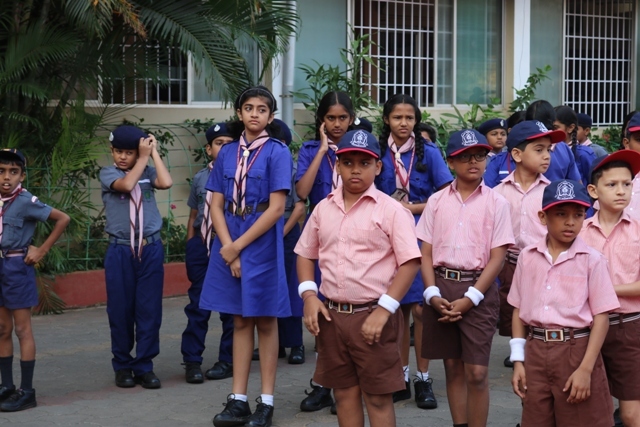 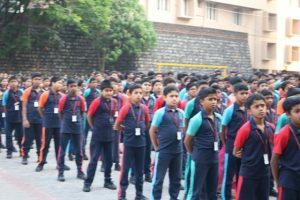 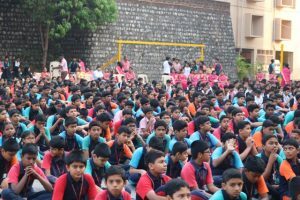 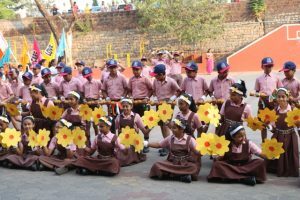 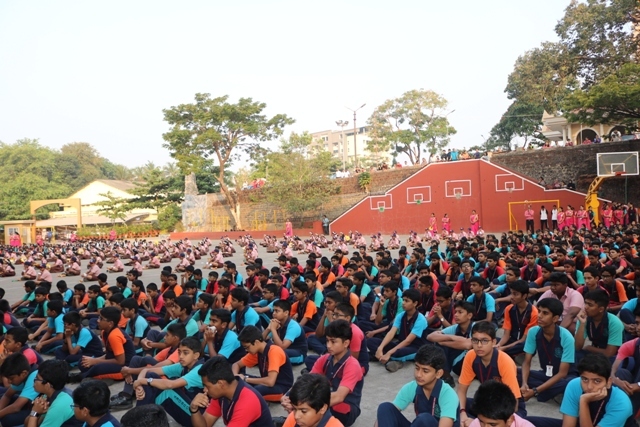 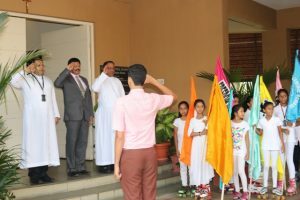 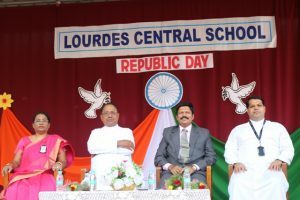 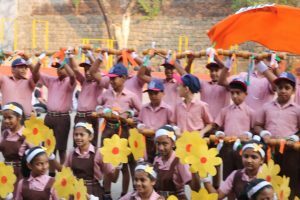 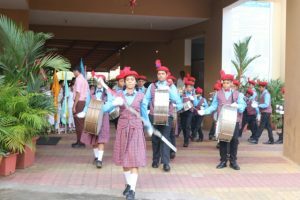 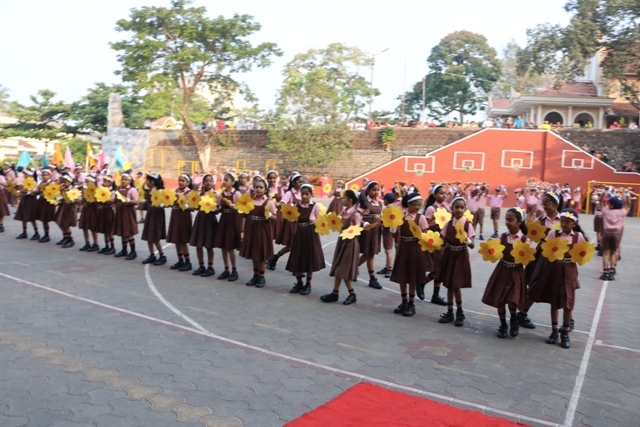 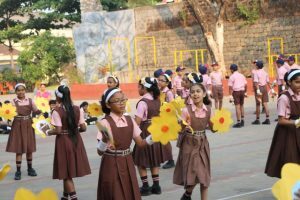 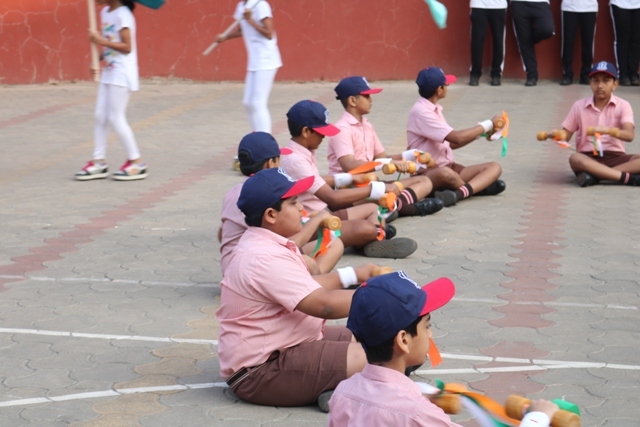 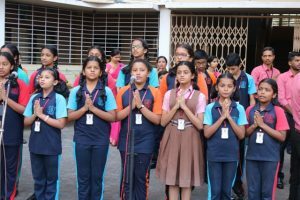 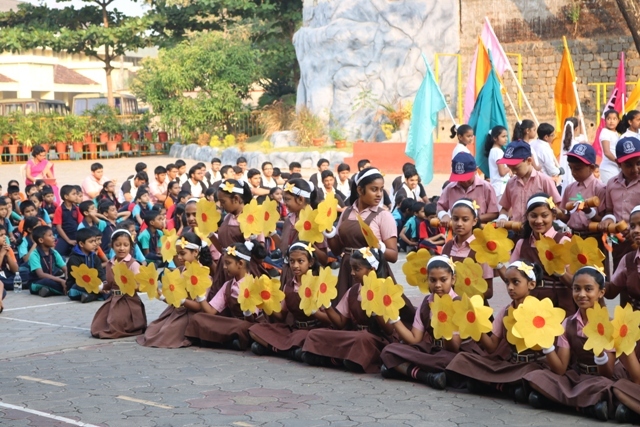 Lourdes Central School celebrated the 69th Republic Day at the school grounds at 8:00 am on 26th of January, Friday 2018. The anchors for the day – Deon and Ishaani welcomed the Chief Guest Mr M.P Noronha, Manager of LCS Rev. Fr Wilson L Vitus D’Souza, Principal Rev. 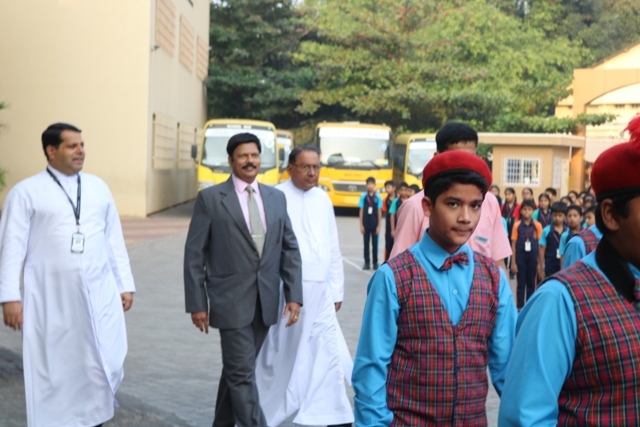 Fr Robert D’Souza and Vice Principal Mrs Belita Mascarenhas. 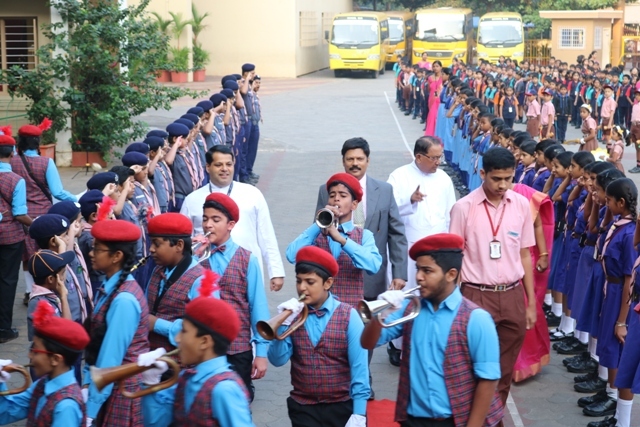 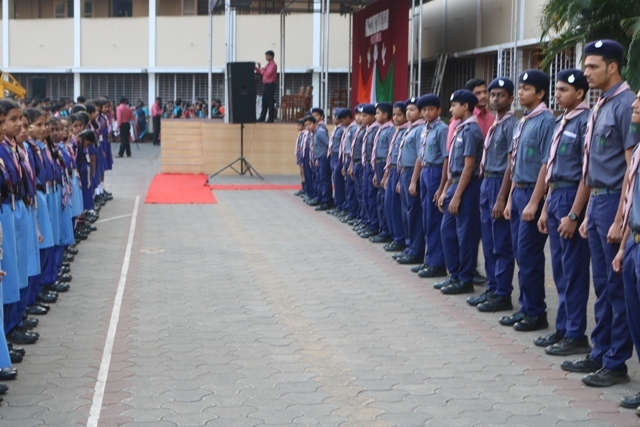 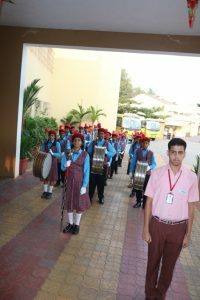 A standing ovation by the students of LCS was given to the dignitaries along with the school band. 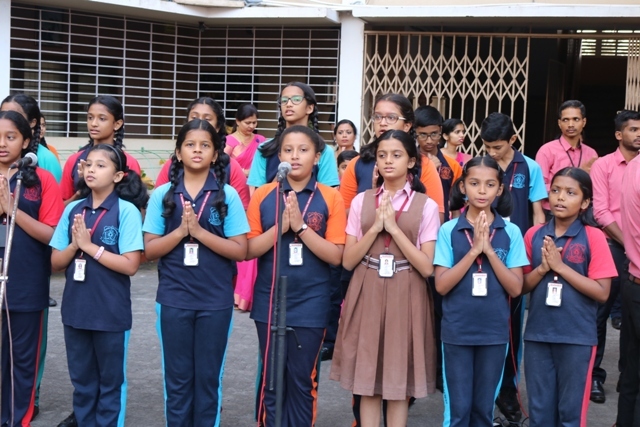 The programme began with a prayer song sung by the School Choir. 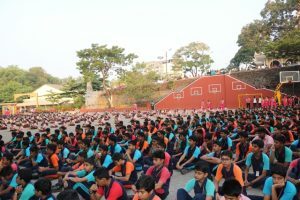 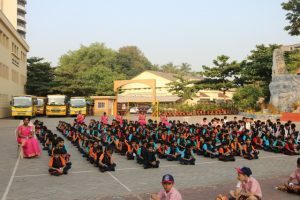 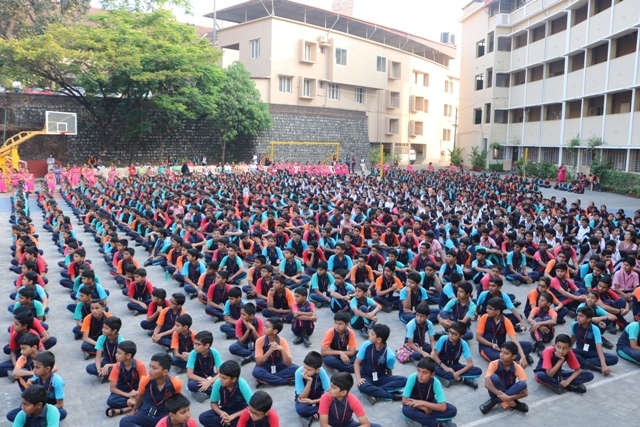 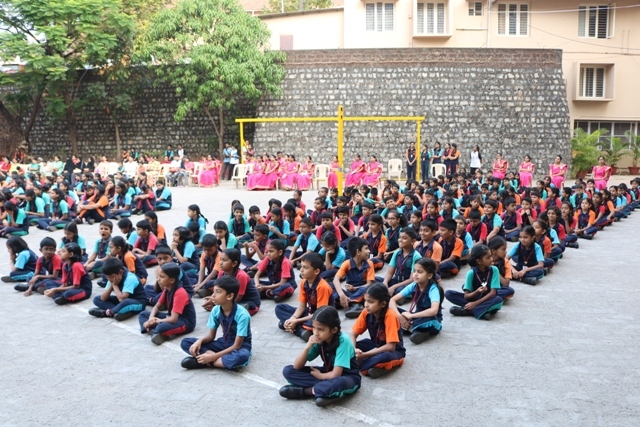 Mehek of class 9 welcomed the gathering. 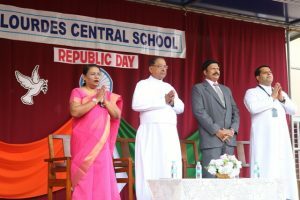 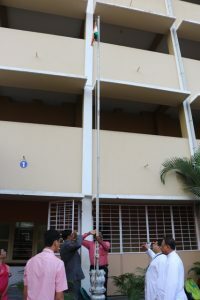 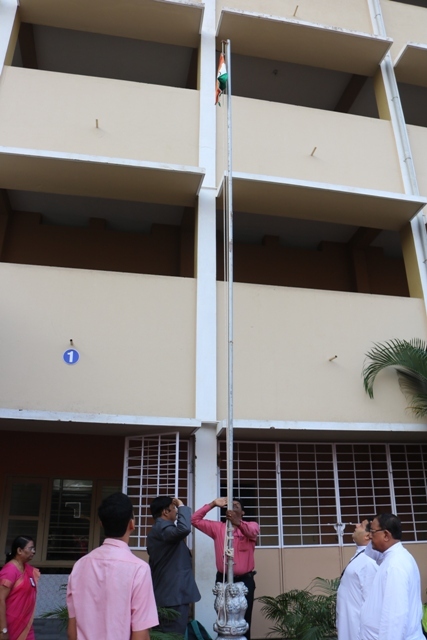 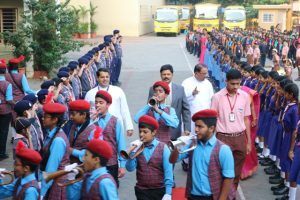 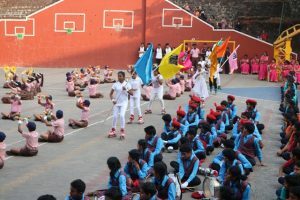 The Chief Guest hoisted the national flag along with the dignitaries who were escorted by the head boy Abner by singing the National Anthem . 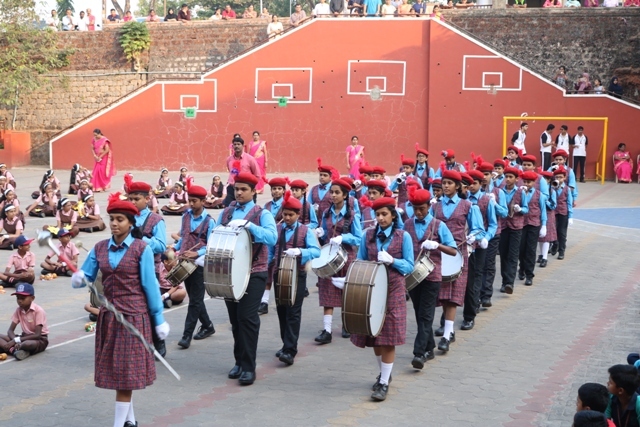 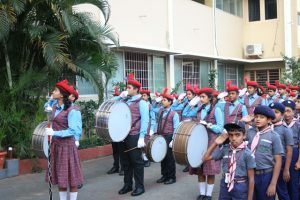 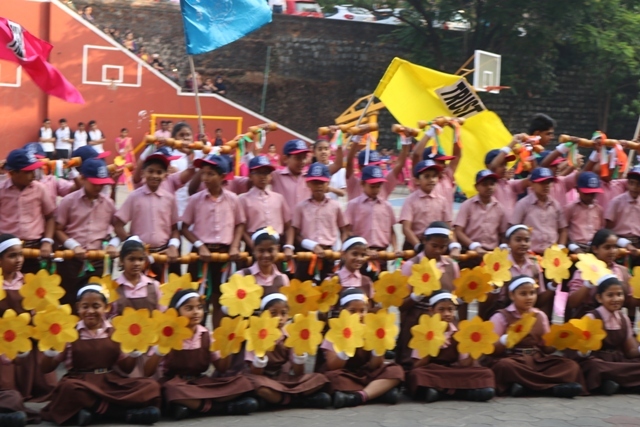 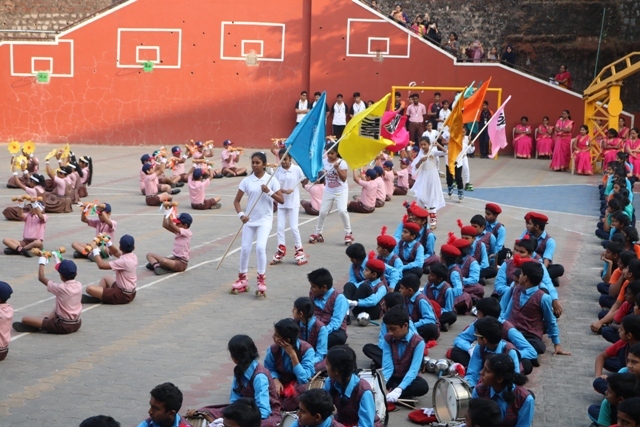 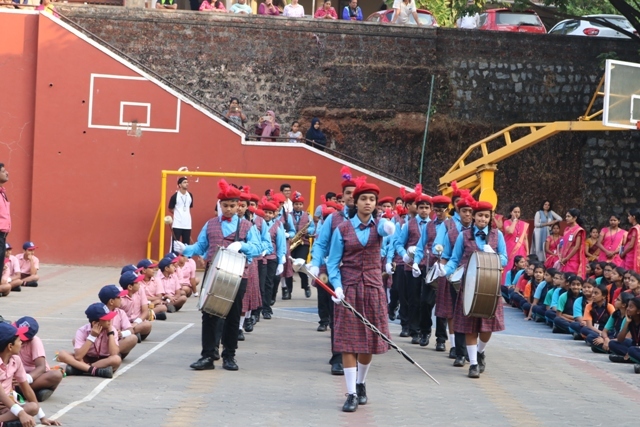 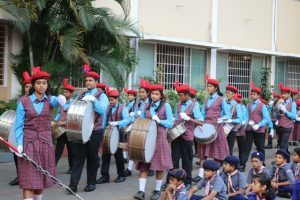 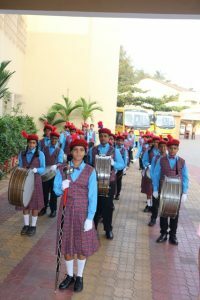 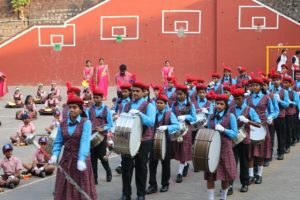 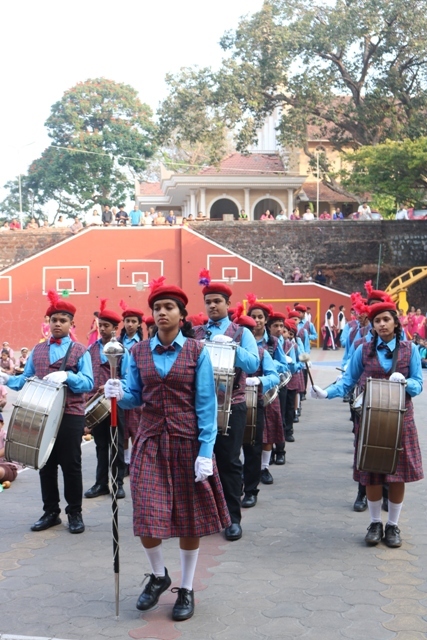 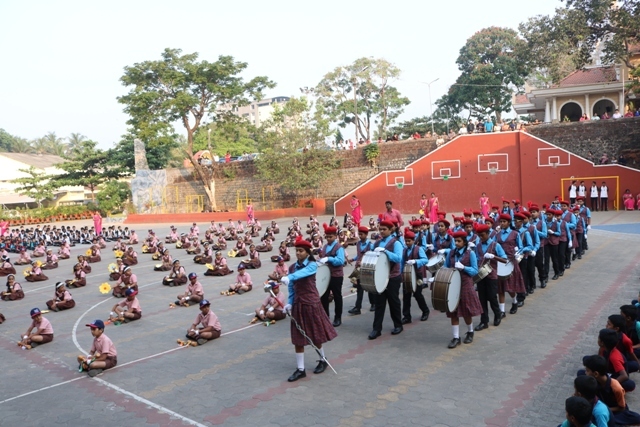 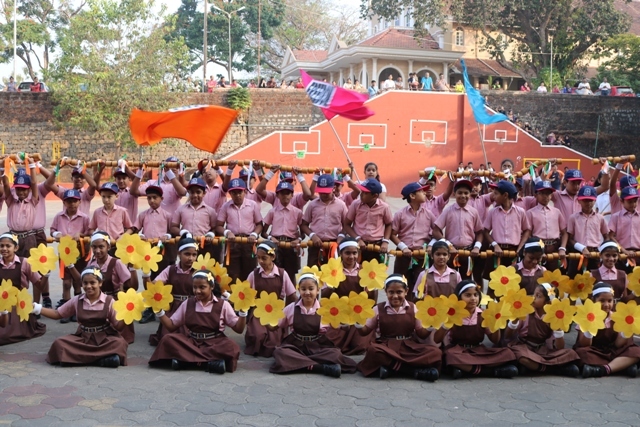 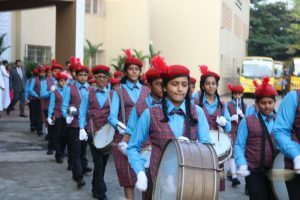 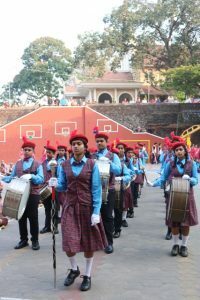 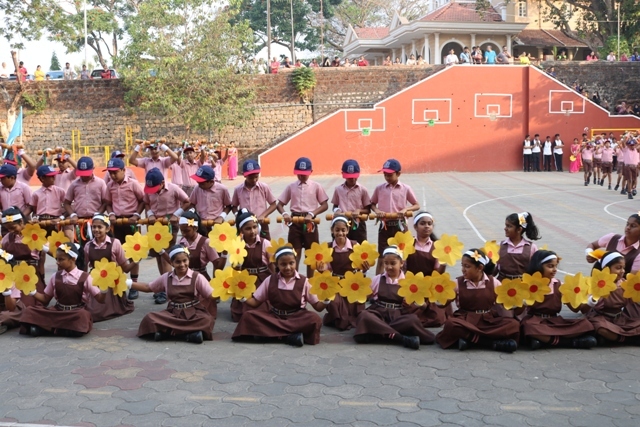 The school band performed melodiously which was indeed a celebration for the day. 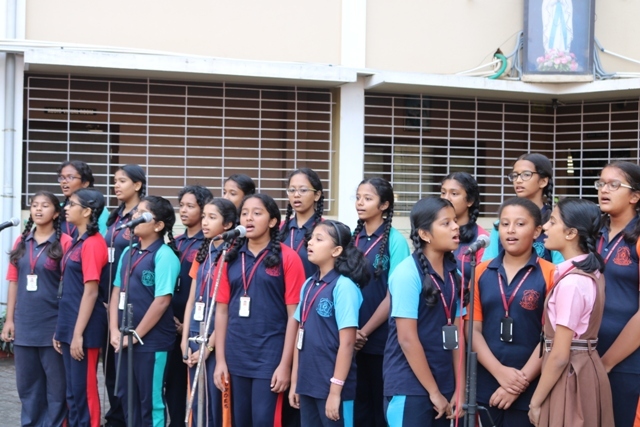 A flute lead was given by Luke of class 8 which was an exhilarating performance. 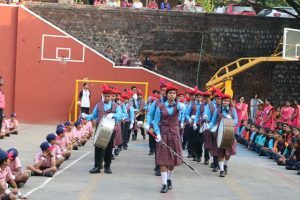 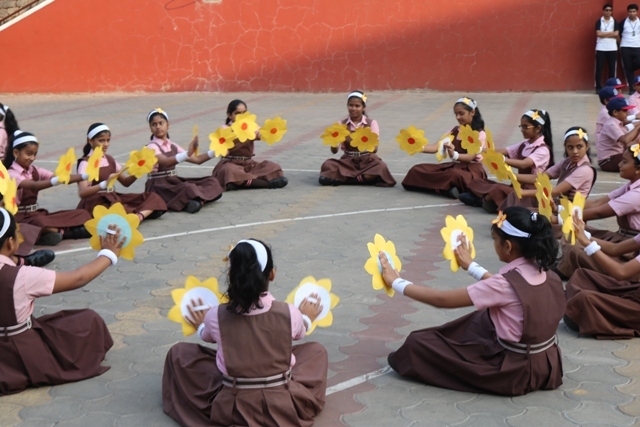 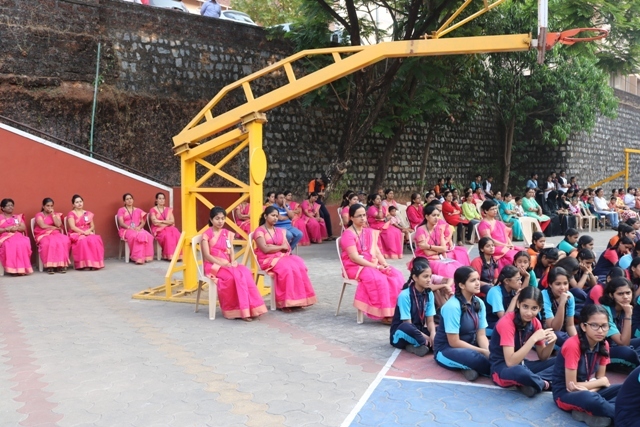 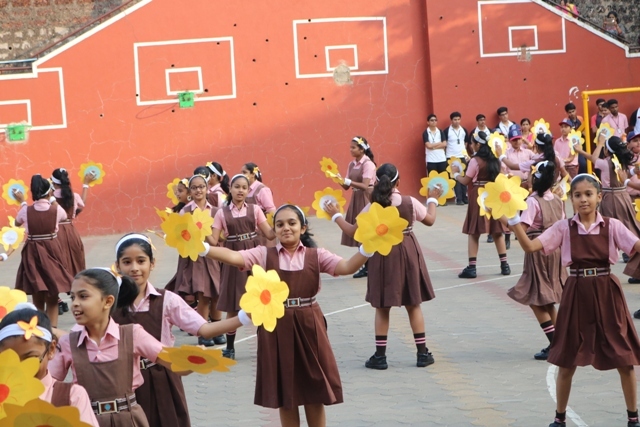 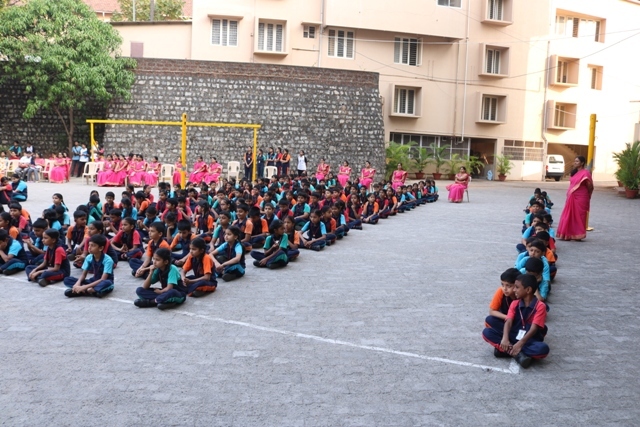 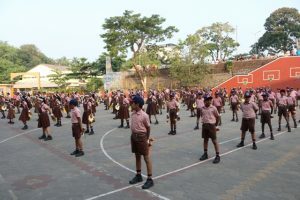 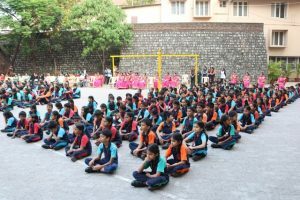 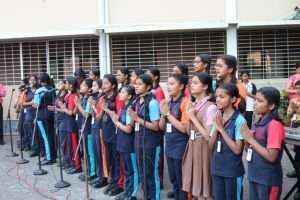 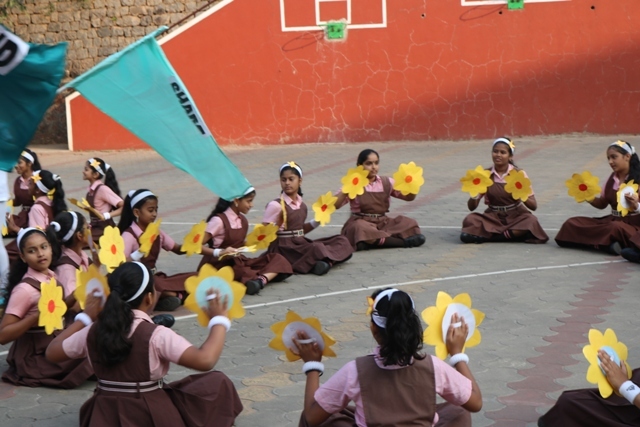 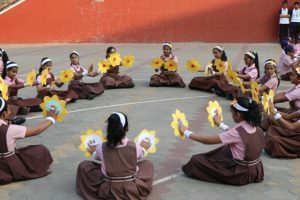 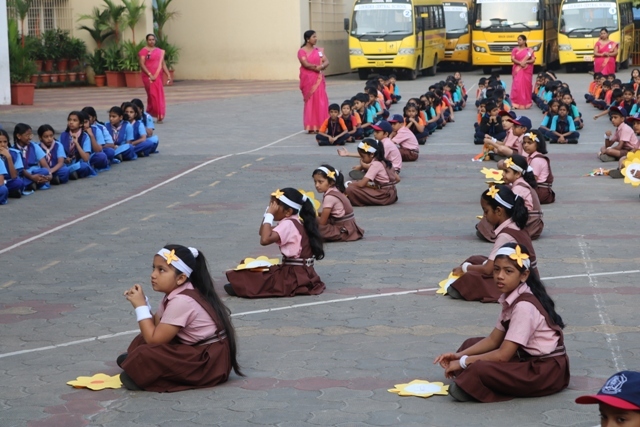 The significance of the day was presented by Ananya of class11 in English and by Anushka of class 9 in Hindi. .
An exuberant drill performance was displayed by the students of class 5. 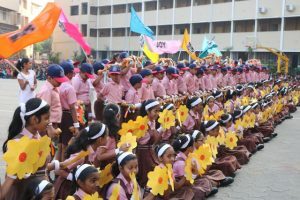 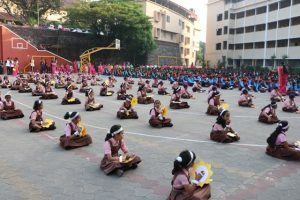 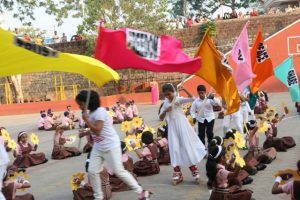 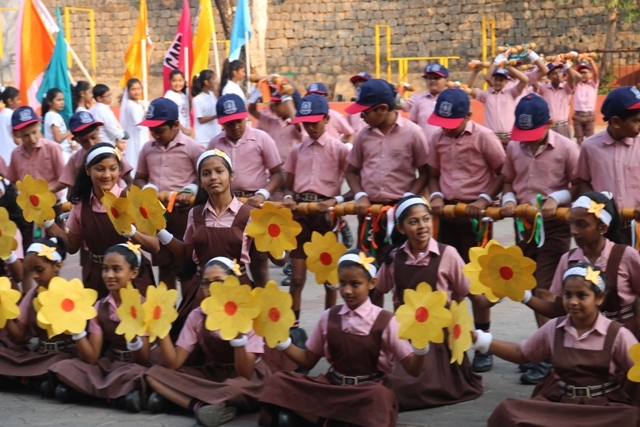 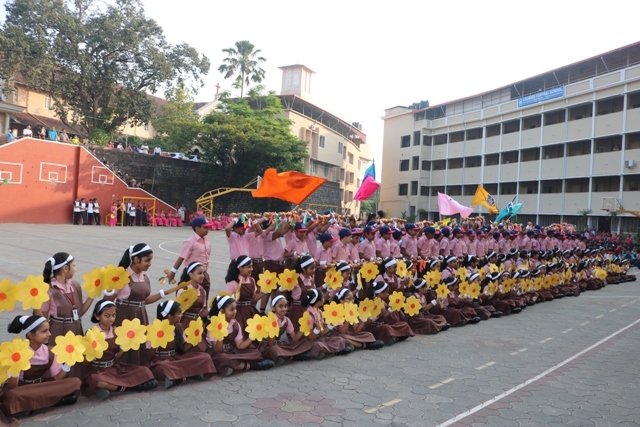 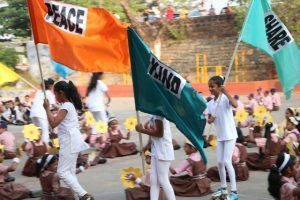 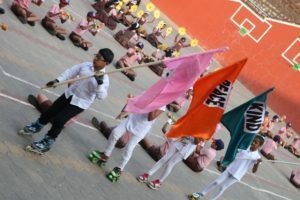 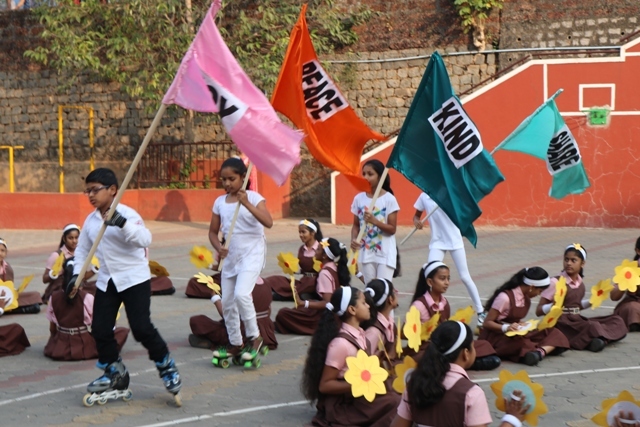 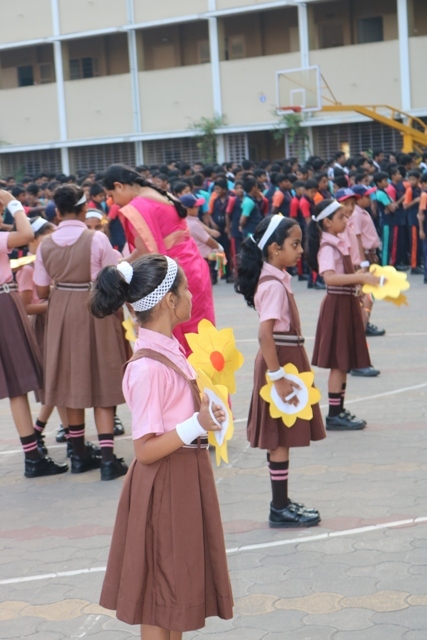 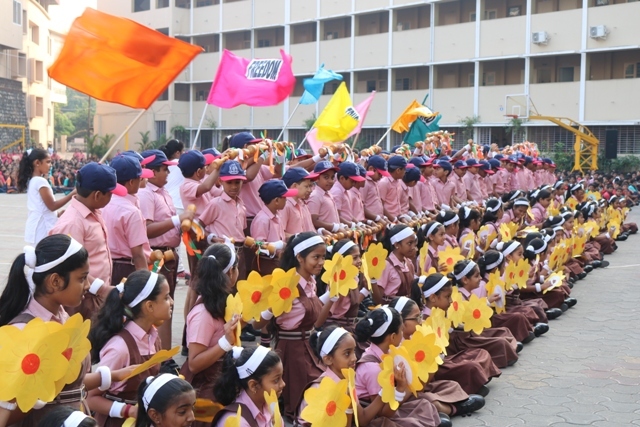 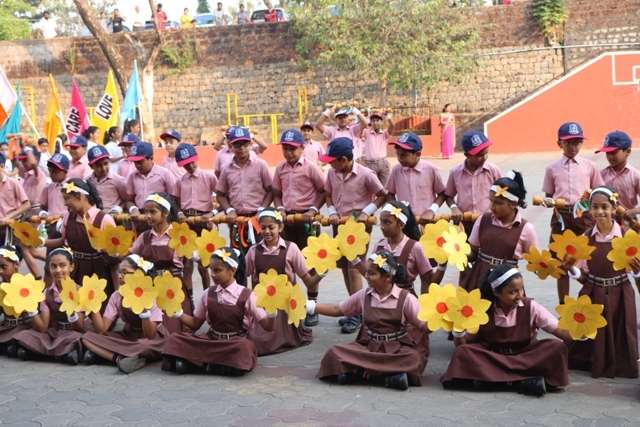 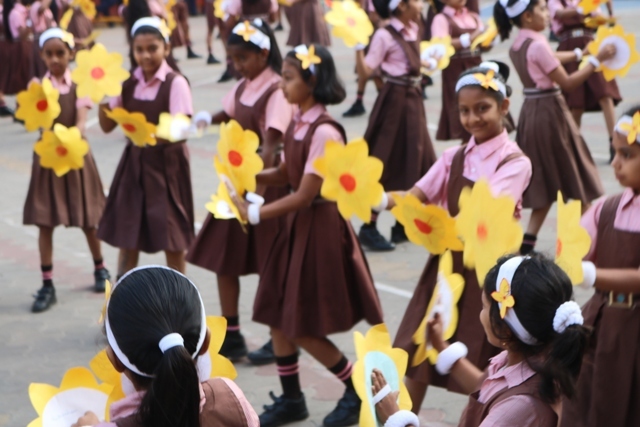 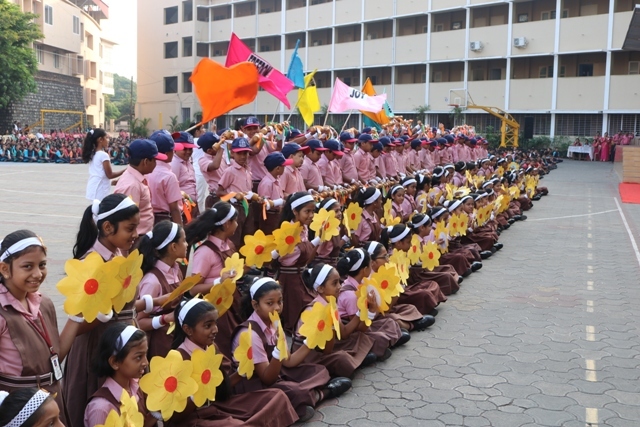 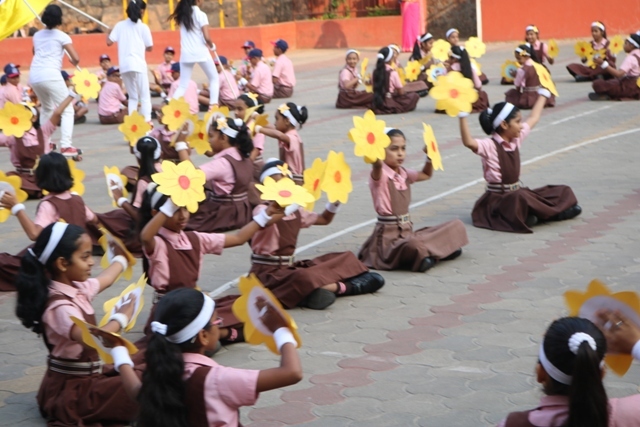 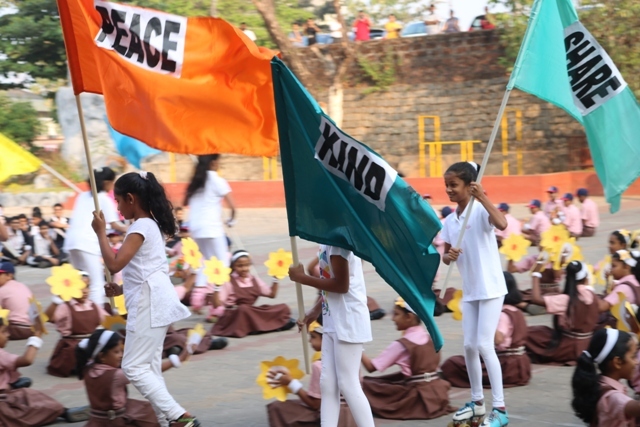 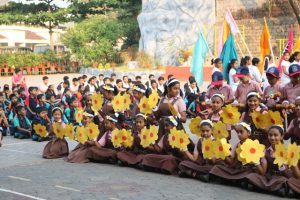 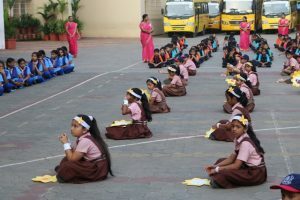 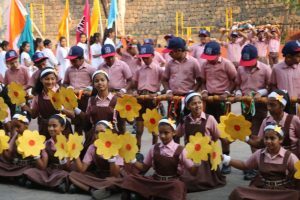 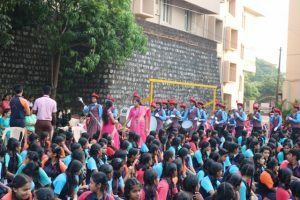 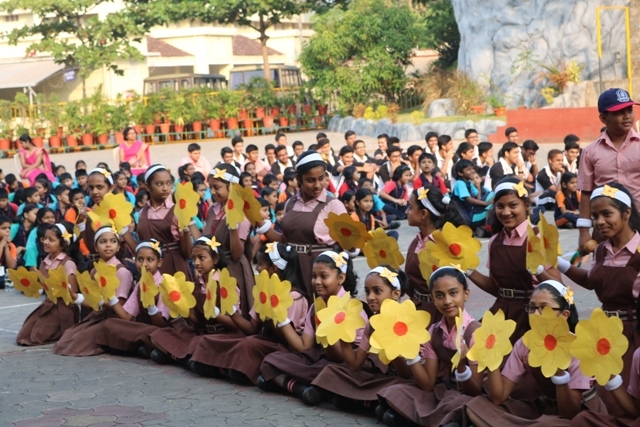 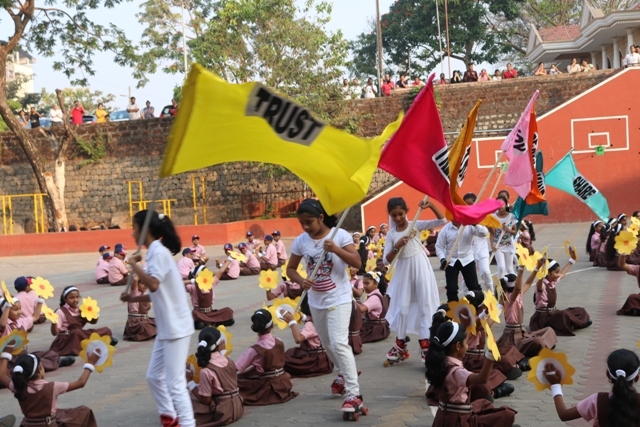 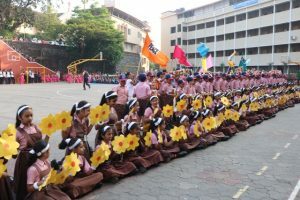 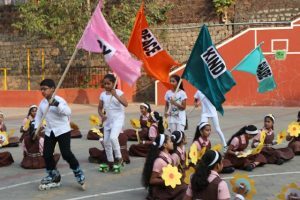 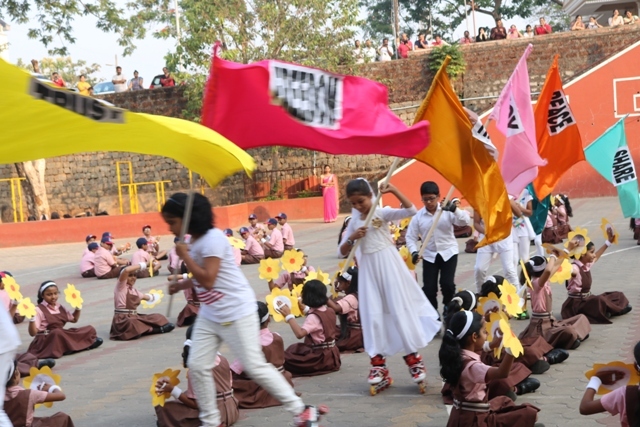 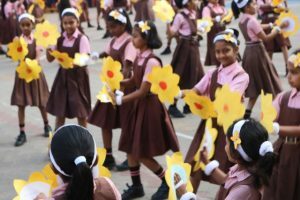 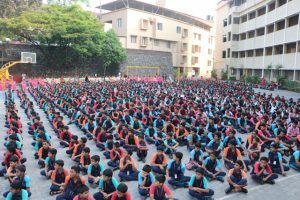 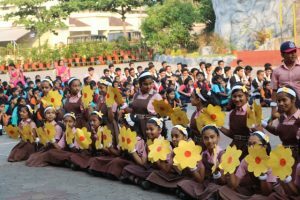 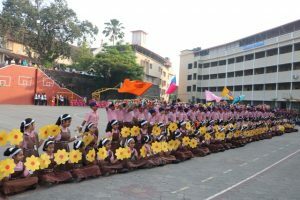 It was a perfect symmetric formation of students in a creative pattern with a display of values such as trust, freedom, share, truth, love, care, kind and joy which reminded of the parade held in the capital city. 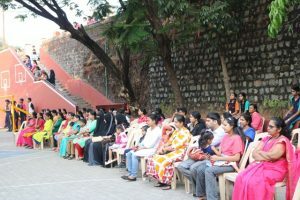 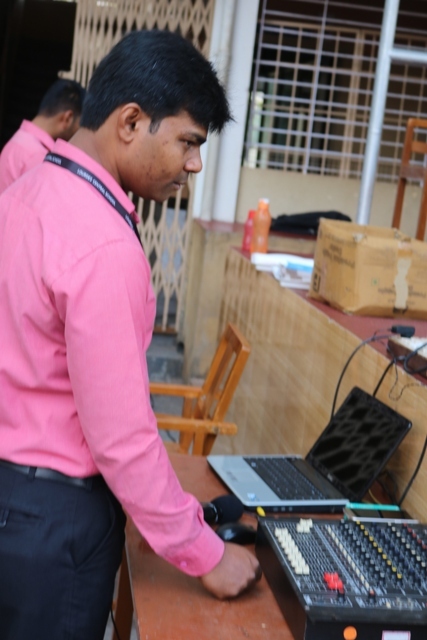 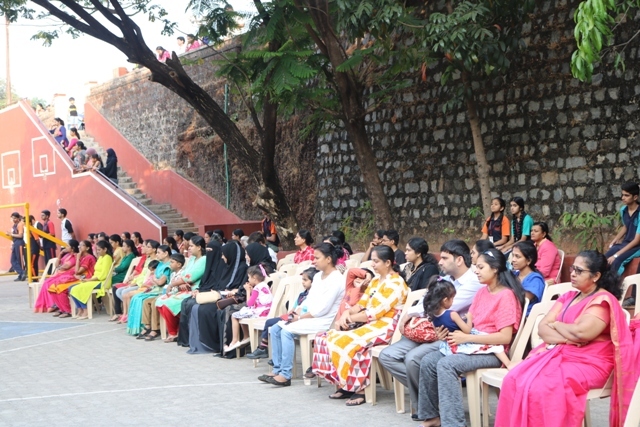 The manager of LCS Rev Fr Wilson Vitus L D’souza in his presidential address said that it was a great day to remember all the freedom fighters. He also said that we need to get together to take care of the social issues and evils that are coming up in the society. 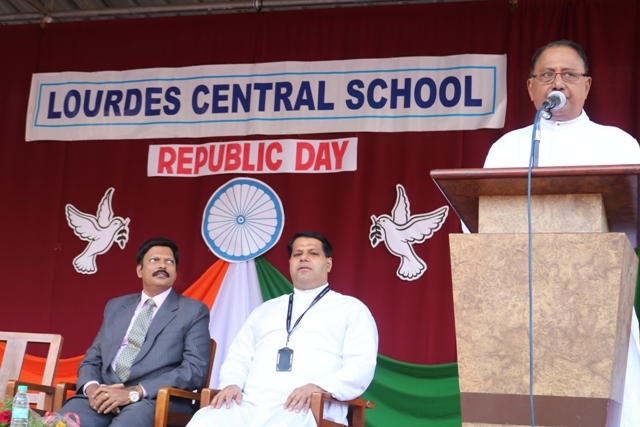 He stressed that only a family and a teacher can play an important role in building up cultural humanity . 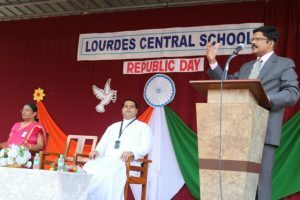 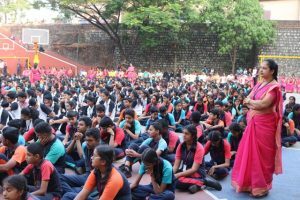 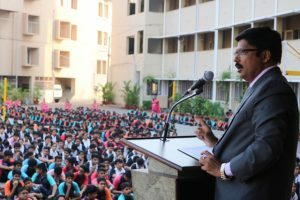 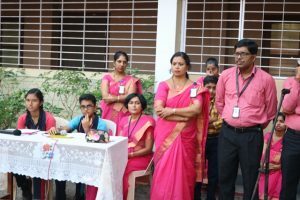 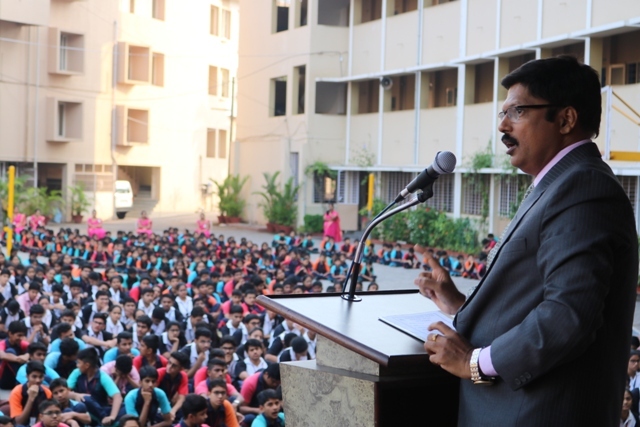 The chief guest a dynamic and versatile personality of the day Mr M.P Noronha gave away a strong message to the students regarding constitutional posts in the country. 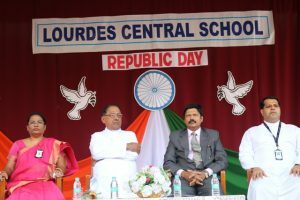 He said that we were celebrating a day of new history of our nation of when the constitution was formed. 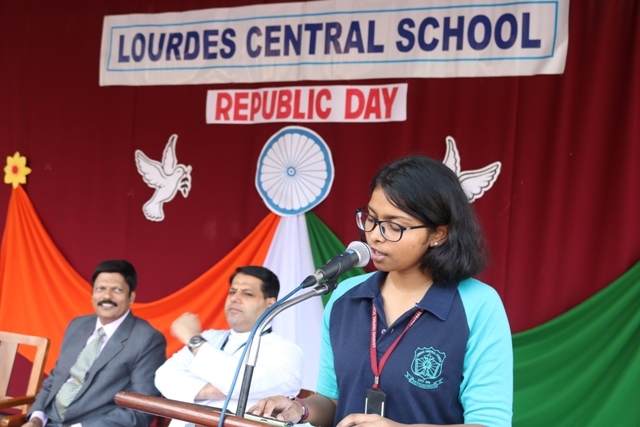 The chief guest reminded of the articles of the constitution with regard to justice, liberty, equality, brotherhood, fraternity, dignity of each individual. 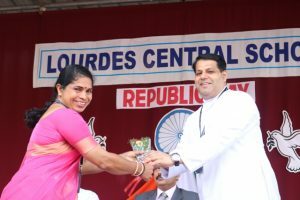 He reminded that the blood that circulates in each individual is nothing but the hard work of all the individuals of every religion. 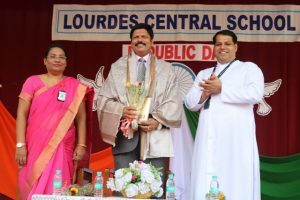 He gave the example of paddy and the rice that we eat. 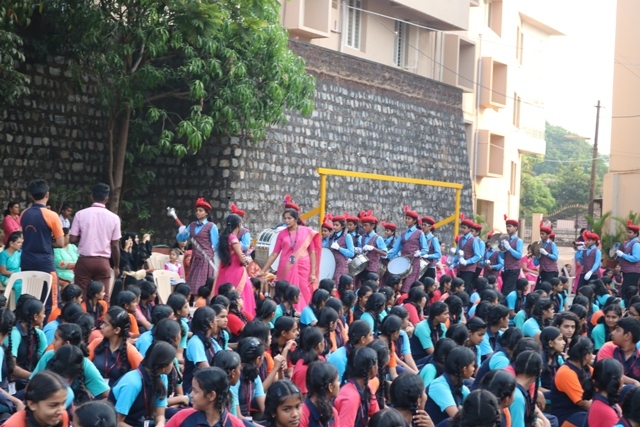 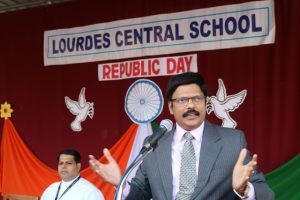 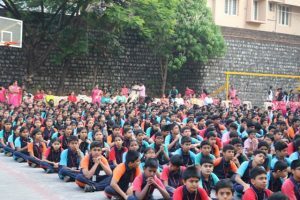 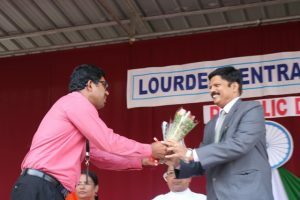 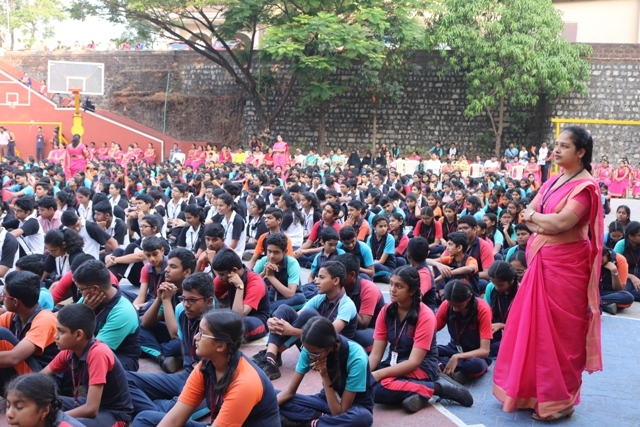 He said that it is our right to vote when we reach the age of 21.Mr M. P Noronha said that Lourdes Central School was the best school in Karnataka and advised as well as blessed the students that they need to take up constitutional posts which involve all the higher authorities starting from the President. 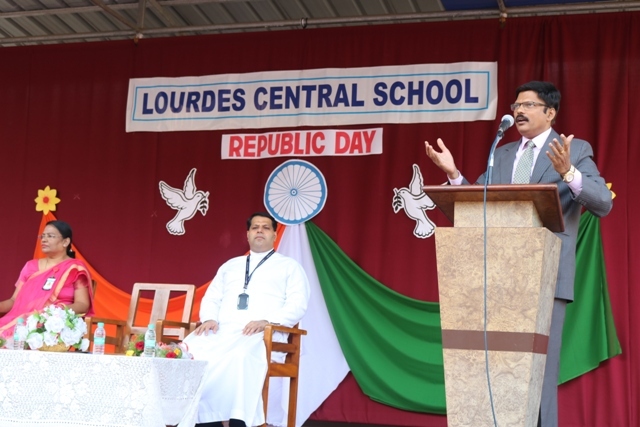 He asked the students to resolve that they would strive to achieve a constitutional post. 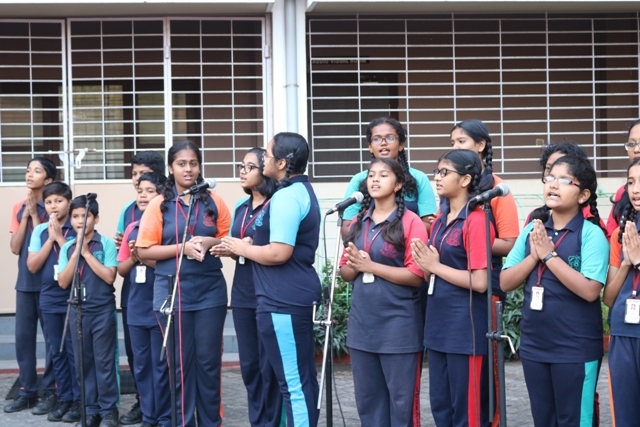 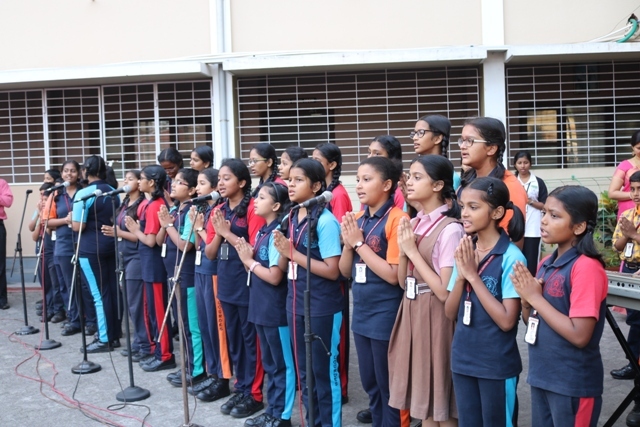 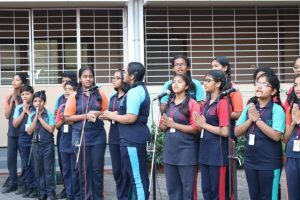 The Choir group of LCS presented a patriotic song which instilled the fervour of nationalism. 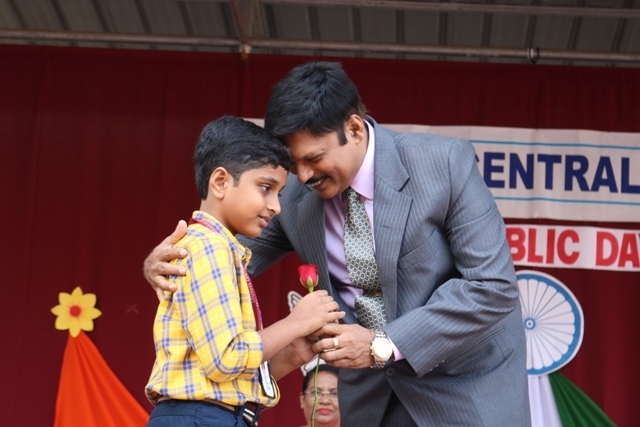 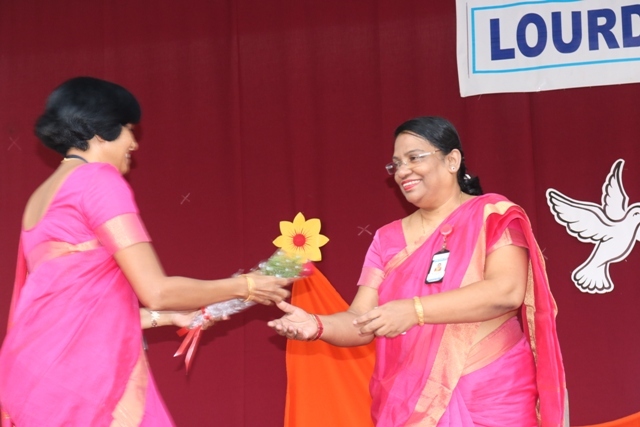 A student was wished on his birthday with a floral greeting by the Chief guest. 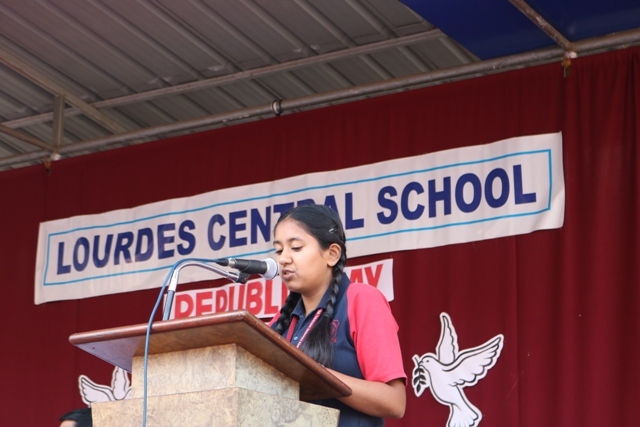 Shristi Jalan of class 9 proposed the vote of Thanks. 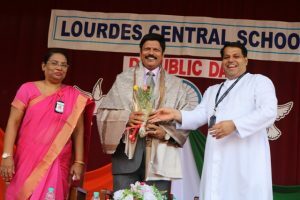 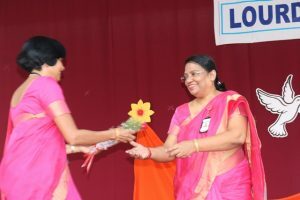 The chief guest was then honoured with a shawl and a memento by father Principal.